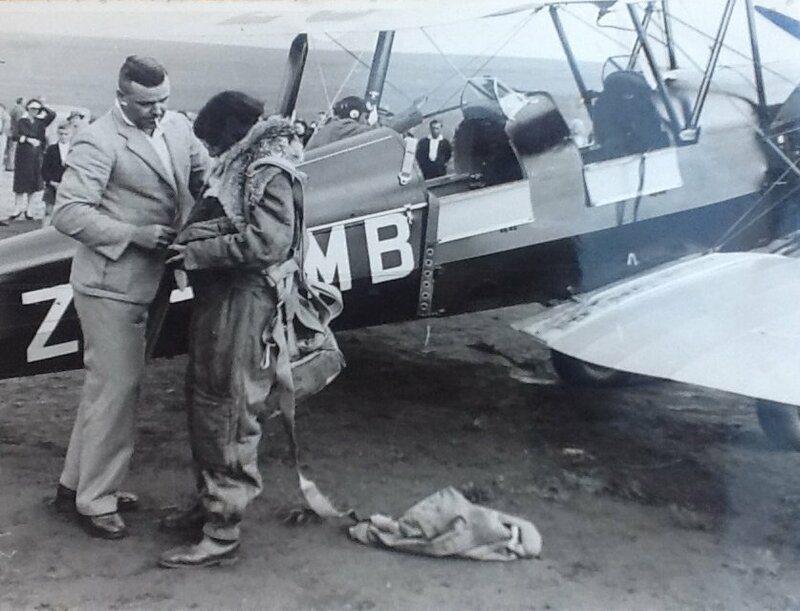 Jackie Moggridge after her first flight in South Africa. She was age 14. Copyright Candy Adkins. Dolores Theresa Sorour was born in Pretoria, South Africa, where she gained her ‘A’ flying licence at a tender age. 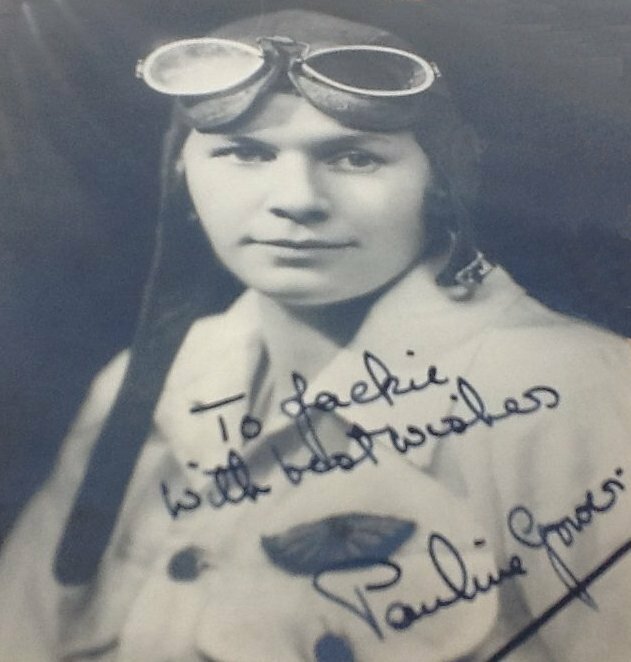 Jackie Moggridge, aged 17, was the first woman to do a parachute jump in South Africa. Copyright Candy Adkins. She chose the name ‘Jackie’ for herself, after her hockey-playing heroine Jackie Rissik. 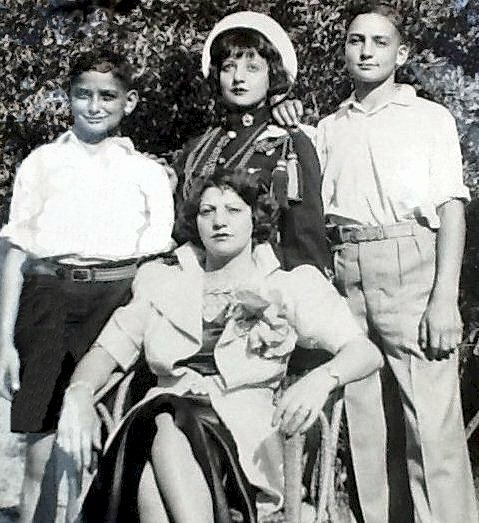 Jackie Moggridge with her mother and two brothers, 6 months before she left South Africa for England, to learn to fly. Copyright Candy Adkins. In 1938 she came to England to gain her ‘B’ flying licence at Witney Flying Club, Oxford. At the outbreak of war in September 1939, she was grounded along with all flying clubs. She joined the WAAF and was based in Rye in a radar station, where she stayed until her chance to transfer to the Air Transport Auxiliary (ATA) became a reality. Women’s Commandant, Pauline Gower, recruited Jackie into the ATA, at the end of July 1940. She joined at the Hatfield Ferry Pool and was the youngest of the female pilots. That very first day Jackie met her childhood aviatrix heroine Amy Johnson. She tells her amusing, star struck first encounter in her book, ‘A Woman Pilot’. Later they were both posted to Hamble Ferry Pool, where Jackie served her country for five years. Countless times she flew over the Solent including just prior to D-Day, where below her she could see the military build-up. Jackie received a signed photograph from Pauline Gower, ATA Women’s Commandant. Pauline was Jackie’s mentor. Copyright Candy Adkins. Etched with sarcasm he asked if she’d been the pilot who’d approached with flaps down all the way. ‘Oh, that is what it’s for?’ said Jackie with a straight face. The RAF Officer bristled. This was typical of Jackie’s use of humour to handle awkward types,” concluded Peggy. The ATA was closed down in 1945, after the war ended. Jackie Sorour got married the same year to Reg Moggridge, an army Captain, in Taunton, Devon. 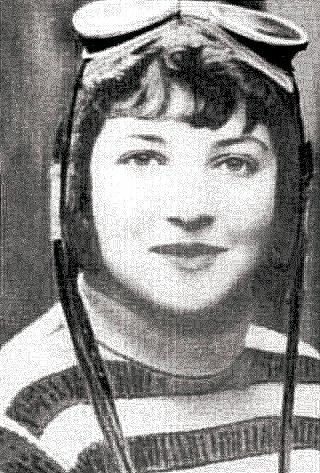 Post-war, the airlines reverted to the pre-war prejudice against women pilots. Jackie settled down to married life and their first child, Jill, was born. 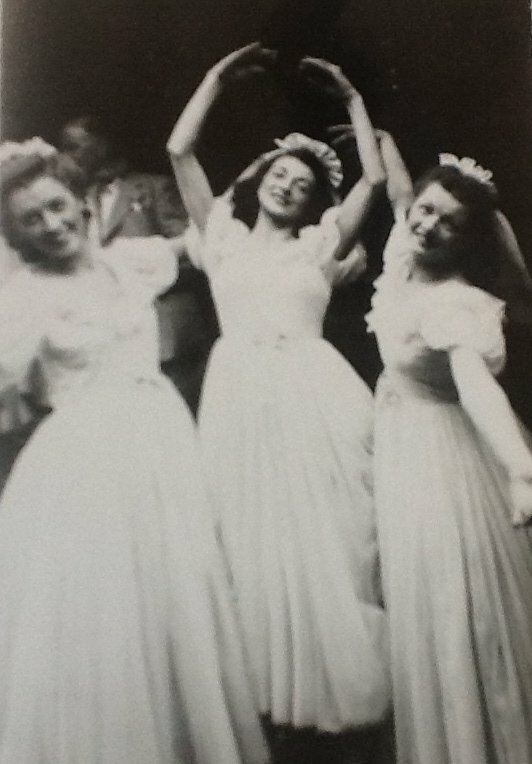 Jackie Moggridge as a member of the Taunton Amateur Operatic Society. Copyright Candy Adkins. Between 1947 and 1949 she became active in the Taunton local theatre and operatic society, and gained good reviews for her performances. Jackie also put on charity concert parties, with more than a dash of light humour. But the itch to fly was always there. She seized the chance to join the RAF Volunteer Reserve. This, together with Jackie’s success in local amateur dramatics, culminated in an interview with Richard Dimbleby in 1950. He travelled the country meeting interesting people with his BBC radio programme ‘Down Your Way’. When he visited Taunton, he quizzed her about her ATA days and then joining the RAFVR, gaining the rank of Pilot Officer Moggridge. Jackie Moggridge with family and Richard Dimbleby from BBC Radio ‘Down Your Way’. Copyright Candy Adkins. In the early 1950s Jackie gained her commercial licence at Southend-on-Sea. This led to a series of adventures unimaginable today. 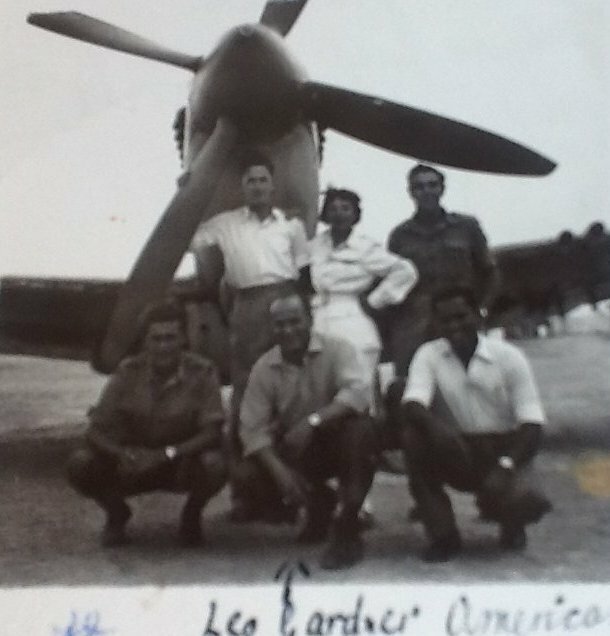 Spitfires to Burma – Jackie Moggridge with other pilots. Copyright Candy Moggridge. Starting in September 1954 there were hair-raising episodes in Jackie’s flying career that even today, sounds like the stuff of nightmares for souls less brave than her. There was a brief, totally innocent, brush with the criminal underworld. She was lucky to escape with her life. (Sorry folks, you’ll have the read her book to find out!). When these dangerous missions came to an end, she was looking around for another flying opportunity. What followed must have seemed tame by comparison. But it was to bring her back into contact with her old wartime friend Mary Wilkins. In 1957 LEC Refrigeration Ltd owned a private airfield in Bognor Regis, Sussex, next to their business premises. LEC owned an Anson, used as an executive aircraft and airborne sales room. Demonstration models of their fridges were kept onboard. These were flown overseas for potential customers to view. George Farley was their pilot. A long haul sales trip to South Africa was planned for November and George needed a co-pilot. Jackie had flown an Anson many times in the ATA. And South Africa was her birthplace. She applied and was appointed. The successful sales trip took several weeks and covered 15,000 miles. 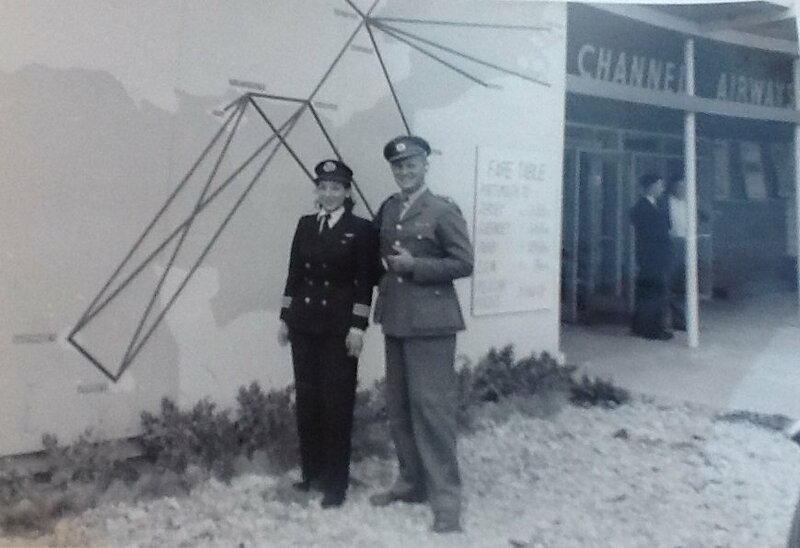 Jackie with husband Reg Moggridge outside Channel Airways building. Map on the wall shows the air routes flown by Channel Airways. Copyright Candy Adkins. Next for Jackie was Channel Airways Ltd., based at Southend Airport. They operated a daily passenger service between their home base to Shoreham, Portsmouth, Isle of Wight and Channel Islands. They needed another pilot. Jackie applied but knowing the continuing prejudice, omitted her gender. At the interview, the manager was in for a shock when in walked pint-size, attractive Jackie. He wasn’t keen on hiring Jackie but her exemplary air safety record and logbooks proved her worth. 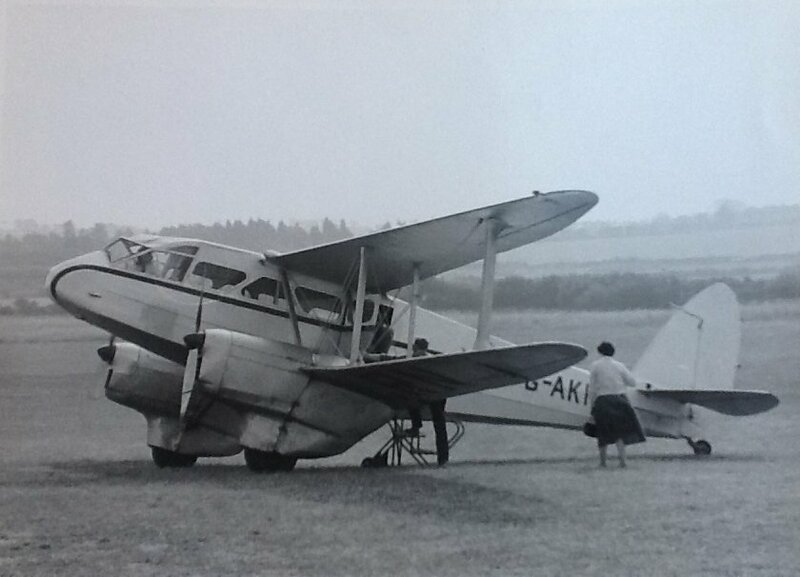 De Havilland Dragon Rapide used by Channel Airways. Jackie is in the cockpit. Copyright Candy Adkins. Having flown heavy military aircraft for the war effort, a little old De Havilland Dragon Rapide would be well within Jackie’s capabilities. Her persistence paid off but for a trial period, she was first put on the Portsmouth to Isle of Wight route. Sandown Airport. Flying into Sandown Airport, Jackie met up with her ATA comrade Mary Ellis (née Wilkins). The two women were based at Hamble together during the war. As Jackie landed, she was amused to see the airfield perimeter was roped off against the neighbouring four-legged livestock. Jackie Moggridge at the controls of a Channel Airways aircraft. Copyright Candy Adkins. Get The Kettle On Mary. 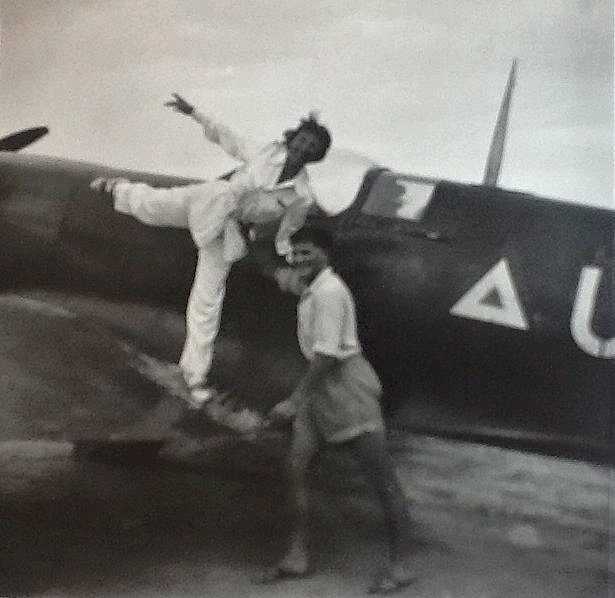 Whenever Jackie knew she’d be on the Isle of Wight route, she’d try to make a quick phone call to Mary, prior to take-off at Portsmouth Aerodrome. It wasn’t for operational reasons that Jackie gave Mary as much advance notice as possible. No, it was down to that British obsession – a cup of tea. It all sounds so charmingly 1950s now, but it helped to keep their friendship strong. When Jackie stopped flying for CA, she kept in touch with Mary. They met up regularly in later years, at ATA annual reunions. Having proved herself on the Isle of Wight route, Jackie was put onto the Jersey and Guernsey route for Channel Airways. Passengers quite often mistakenly assumed she was the airhostess or taxi driver. Sometimes she was the taxi driver. Her duties included collecting local passengers from their homes and driving them to Portsmouth Aerodrome. Channel Airways used an old London Taxi Cab for this service, which Jackie was known to drive at some speed! It was not uncommon for passengers to be dropped off at the airline ticket office by Taxi Driver Jackie, only for those same perplexed passengers to see her again, a few minutes later, climb into the aircraft as Pilot Captain Jackie. She had a reputation for teasing nervous passengers. This was when, for her own in-flight entertainment, she indulged her love of comedy theatre. Sat at the controls, she would pick up a flight instruction manual and pretend to follow the instructions for checking the instrument panel and starting the engine. All of this in full view of her quivering victims in the aircraft cabin with her. Then she’d turn around to them, just before they scrambled for the exit, and grin, “Only joking!” and off she’d fly. During her time with Channel Airways, Jackie flew between Portsmouth, Ryde and Sandown (IW), Jersey and Guernsey (CI). The air route also took in Shoreham Airport, for customs clearance, as Portsmouth Aerodrome lacked those facilities. Back home in Taunton, Jackie had a family life. Husband Reg was kept busy with a successful house building business. Their little daughter Jill experienced a childhood much less than average. Jackie’s desire to fly didn’t mean that she neglected her child. Jill flew most places with her mother during her school holidays. She sat in any available seat on the plane. 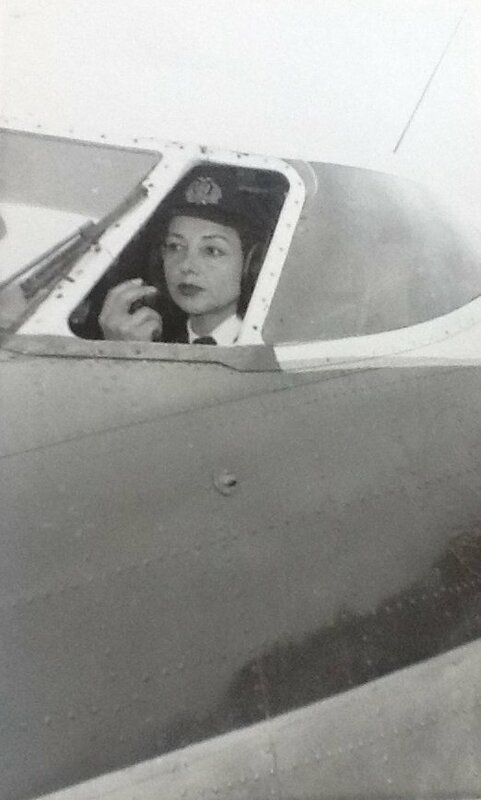 Cockpits and aerodromes were her playground. At the time, Jill saw nothing unusual in this. She grew up thinking every child’s mother was a pilot! 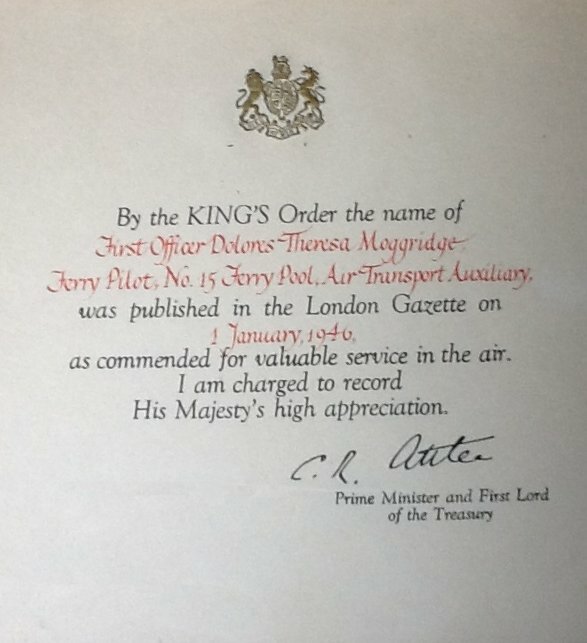 Prime Minister Clement Attlee bestowed a war commendation on Jackie Moggridge on 1st January 1946. Copyright Candy Adkins. Among the honours bestowed on Jackie Moggridge was a Coronation Medal awarded by HM The Queen, for her work during the war. Clement Atlee, Prime Minister at the time, also awarded her a War Commendation. 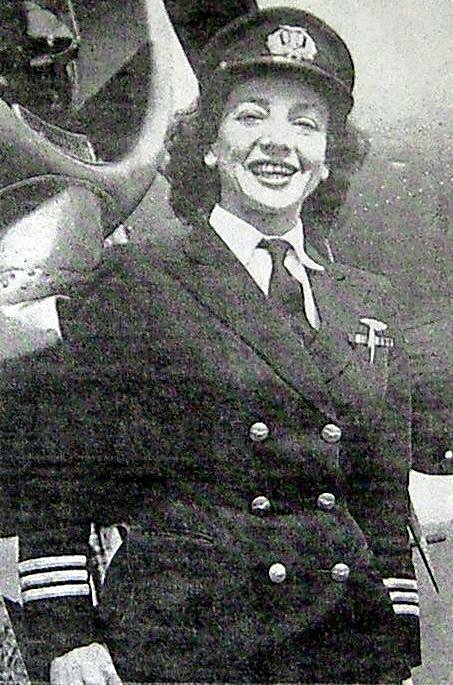 In 1959 Jackie was awarded the Jean Lennox Bird Trophy by the British Women Pilots’ Association. 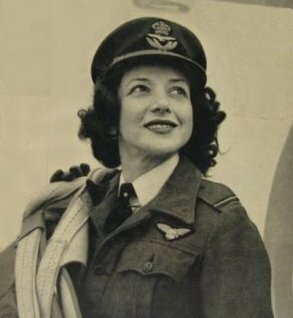 In later life she created the Jackie Moggridge Cup, to be awarded annually to a British Woman Pilot for achieving excellent qualifications in her chosen career. Read about it at BWPA. 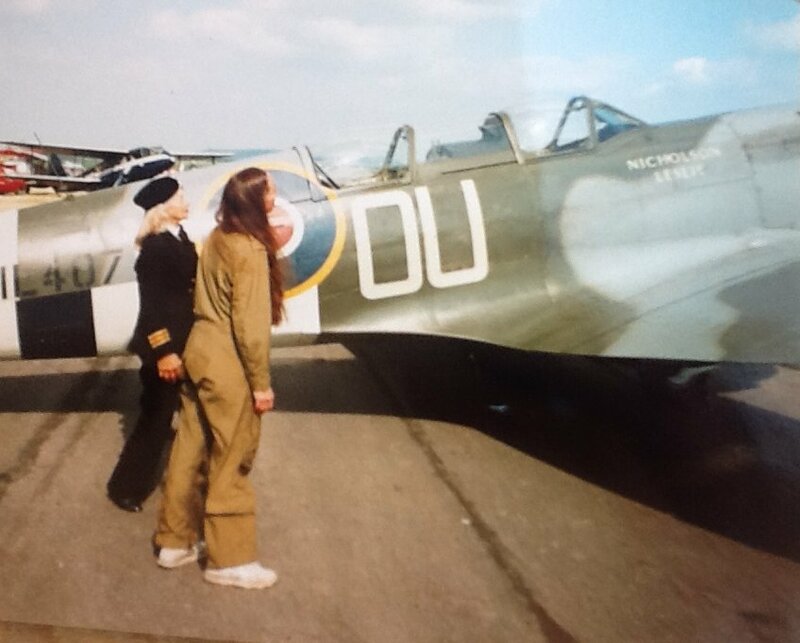 Jackie Moggridge with Carolyn Grace and Spitfire ML407. Copyright Candy Adkins. Forty years after Jackie first flew it, Carolyn Grace took her up in the exact same Spitfire used by the D-Day pilots and gave her the chance to fly it again. Jackie died ten years ago in 2004. Her ashes were scattered over Blackdown Hills from a Spitfire (ML407), piloted by Carolyn Grace. During the war, Jackie was the first pilot to fly that same Spitfire from Castle Bromwich to Selsey, Sussex. There had been a New Zealand Squadron base at Selsey. During the D-Day landings the Spitfire was in the thick of the action. 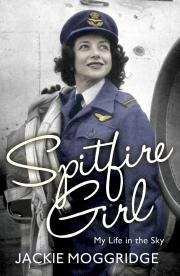 Jackie’s autobiography ‘A Woman Pilot’ is republished by Head of Zeus, from 3rd July 2014 as ‘Spitfire Girl – My Life in the Sky’. Carolyn Grace has written the afterward of this book. Available in printed form and e-book it is full of humour and a fascinating insight into an era long gone, its guaranteed to be enjoyed by a new generation of readers. When first published in 1957, parts of it were censored, for business and political reasons. It will be interesting to see if the unexpurgated version is permitted in this 2014 reprint. The book has been ‘optioned’ by a TV scriptwriter, who has worked on series including, The Diary of Anne Frank, Redcap, and New Tricks. Don’t keep us waiting too long Tess! ”My mother would drop me off on her first flight to Sandown airfield and pick me up in the evening after her last flight of the day and we would return to digs in Southsea. I believe Mary Wilkins kept an eye on me. My mother took me with her whenever she could, sneaking me on to the aircraft, telling me to pretend I did not know her! To learn more about the ATA, visit the ATA Museum website.